Orthotic Brace Takes Soldiers From Limping To Leaping : Shots - Health News An injured leg can cause so much pain that some wounded veterans consider amputation. 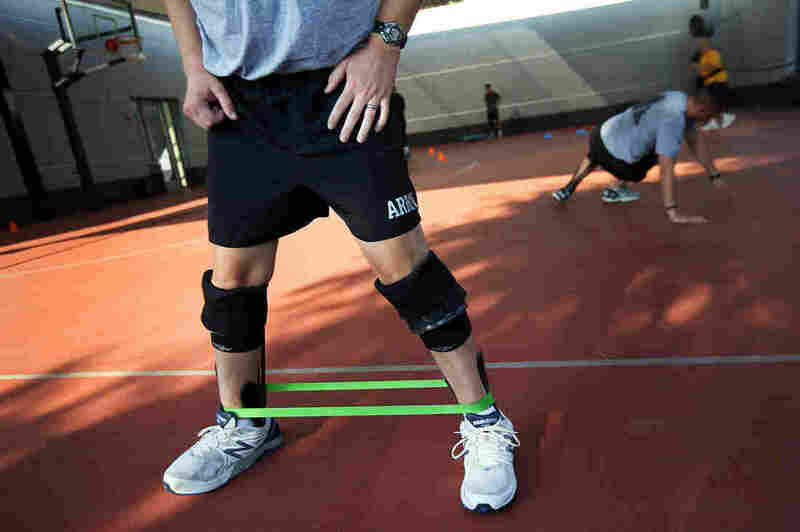 A brace invented at an Army medical center in Texas is getting them up and running again. Soldiers participate in physical therapy while using a prosthetic brace called the Intrepid Dynamic Exoskeletal Orthosis (IDEO), which allows them to use and strengthen severely injured legs. The IDEO brace helps transfer energy so the wearer can step forward. A deceptively simple leg brace is changing the lives of hundreds of wounded service members. 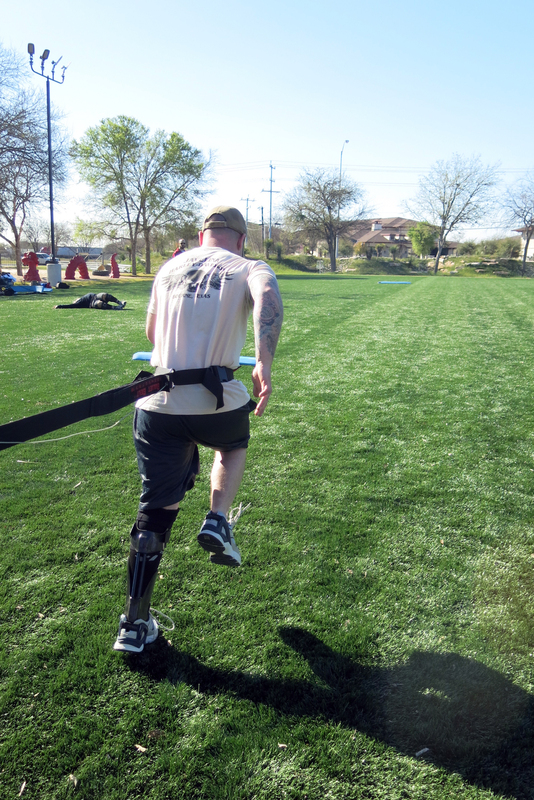 Soldiers with badly injured legs who thought they'd have to live with terrible pain can walk and run again, pain-free. Earlier this month, Army Spc. Joey McElroy took his first steps in the Intrepid Dynamic Exoskeletal Orthosis, or IDEO (pronounced: eye-DAY-oh). The device squeaked a bit as he stepped briskly on an indoor track. McElroy was hit by a car and thrown from his motorcycle on Dec. 5, 2012. "I knew that when I looked down there was bones comin' out of the leg that didn't look correct. And my leg didn't work," he says. Doctors were able to save McElroy's mangled leg, but he had to learn how to walk again. Running was out of the question. "You don't realize how much you miss something 'til you don't have it anymore," he says. "The ability to be able to run again for my own health is a very big deal." McElroy is known as a "limb salvage patient" since he avoided amputation. Physical therapists say some patients like McElroy later decide they would be better off without the leg when see their amputee buddies running around easily on prostheses. "For a while there I was like, 'Just get rid of it.' If I can be on a prosthetic in a week or two and be running, just lop it off," McElroy says. But with the IDEO brace, "Now I'm glad it's here." Air Force Staff Sgt. Anthony Mack practices the running technique required with the IDEO. You can't land on your toes or heel — instead, you have to adjust your stride to hit mid-foot. 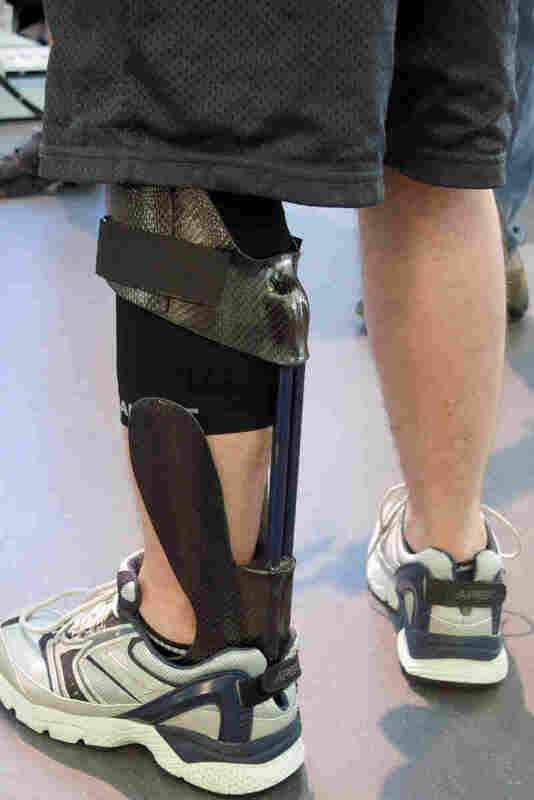 The brace, which was developed at the Center for the Intrepid at Brooke Army Medical Center in San Antonio, is molded out of lightweight black carbon fiber and custom-fit to each person. A foot plate inside a shoe attaches to a strut that runs up the back of the calf to a cuff. The inventor, prosthetist Ryan Blanck, says it works kind of like a spring. Force applied to the foot plate bends the strut. As a person steps down, it bends the foot plate, transferring energy forward. And if you use it correctly, it takes pain out of the equation. Army Spc. Joey McElroy practices resistance running with the IDEO. Soldiers who are fitted with the brace spend four weeks learning how to use it in a "Return to Run" program. The biggest challenge with the IDEO comes in relearning how to run. A patient can't land on toes or heel — instead, they have to adjust their stride to hit mid-foot. After trying to run for the first time, McElroy breathes heavily but is all smiles. "It's exhausting but it's awesome," he says. "I just wanna go faster." So far the Center for the Intrepid has fitted more than 550 service members with the IDEO. Dr. Donald Gajewski, an orthopedic surgeon and director of the center, says the IDEO has made for less business in the operating room – and that's a good thing. "It's great to have a bunch of people around here who I don't know their names," Gajewski says. "Because if I'm getting involved with their care, I'm taking a limb off." Gajewski admits the IDEO is not right for everyone. Some patients still have pain with it, so they opt for an amputation. But for most, the orthotic device has allowed them keep their leg. Some have gone on to run marathons, surf and jump out of airplanes. About 50 percent of IDEO users will return to active duty. Blanck, the inventor, is now working in the private sector to bring the device to civilians. It costs around $10,000. At the Center for the Intrepid, there's a waiting list of two to three months.